Dungeons & Dragons, long the game of choice for nerdy social introverts, has always been hampered by one incontrovertible weakness: This game designed to foster social interactions among people has required you to actually be in the physical presence of other people. Sure, you can play online, but there’s just no substitute for the feeling of sitting around a table, staring intently at small figurines. If only those other people didn’t need to be there, requiring you to either leave your home or invite others in, both unpleasant prospects. 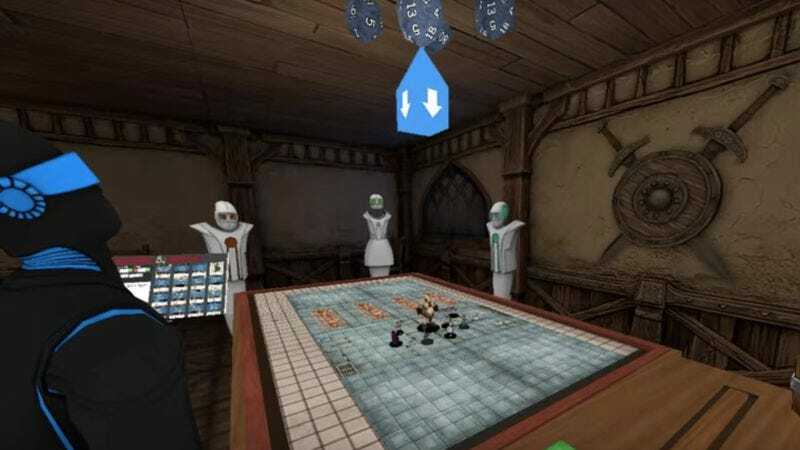 Thankfully, there will soon be a way to experience the fun of playing Dungeons & Dragons with other people around a board as God intended, without having to suffer the physical proximity that deters so many. Gizmodo reports developer AltspaceVR has created a virtual reality version of the gaming experience, leaving players free to stay in their bedrooms, clad in pajamas, the entire atmosphere covered in a thin sheen of Cheetos dust. As demonstrated by the explanatory video below, the company managed to secure the participation of Wizards Of The Coast, the company that owns Dungeons & Dragons, and therefore was able to develop a VR experience second only to virtually standing in line outside a virtual theater to buy virtual Queensrÿche tickets. The setup includes a browser panel for accessing web resources during play, a bar to toggle among the various dice, and even an assortment of music meant to set the mood for various scenarios. It’s designed to work with the Oculus Rift DK2, scheduled to be released commercially in early 2016, meaning the days of being able to stare at small digital versions of things that are already small symbols of things existing only in players’ heads, while everybody basically does simple math equations, is nigh. It’s not quite recursing, but it’s about as close to the apotheosis of nerd-dom as you’ll get this week.